In a time where this country is in the middle of a terroristic society, the economy is in turmoil, healthcare concerns run amuck, the President Elect will need a First-Dog that can help him sniff out moles in his organization. 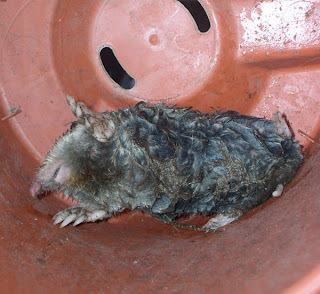 Below is a picture of What the Dog Dragged In to my house this morning!! We have been plagued by this varmint for over four months now. It has torn up our backyard and cost us over a hundred dollars in attempts to rid ourselves of it. 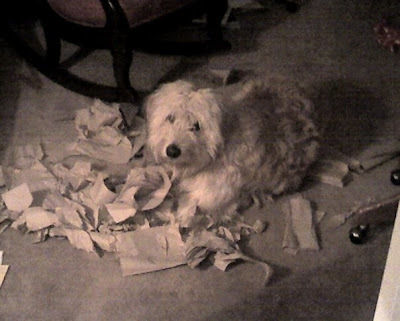 But today, Luke, our Goldendoodle, put an end to all of that! He, single-handedly, (or quadra-pawedly) captured and terminated the MOLE that had infiltrated our environment. He was also savvy enough to bring the rodent (I think it's a rodent) into our house and drop it onto our oriental rug for our viewing pleasure! 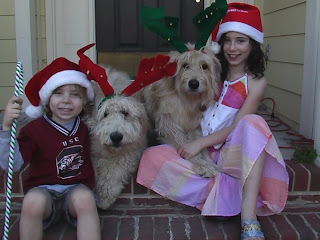 This proves, yet again, that the Goldendoodle, is indeed The Dog of Destiny for President Elect Obama's family. Surely, this presidential team will need someone on their staff that is able to sniff out a MOLE when it exists. And not only recognize a mole in the organization, but have the wherewithal to do something about it! 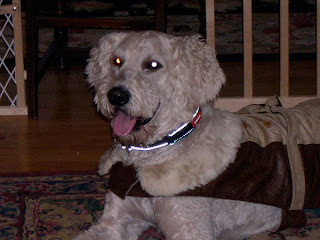 On this Thanksgiving weekend, I am reminded to count my lucky stars for my Goldendoodles, Gus and Luke! Without Luke, this MOLE would still be loose doing whatever it pleased! 1. any of various small insectivorous mammals, esp. of the family Talpidae, living chiefly underground, and having velvety fur, very small eyes, and strong forefeet. 2. a spy who becomes part of and works from within the ranks of an enemy governmental staff or intelligence agency. Compare double agent. As we were reciting, "Ashes to Ashes, Dust to Dust" and dropping the MOLE into the hole, my nine year old, Savannah, asked, "What if it is still alive, Daddy?" I simply replied, "Well, then it will be able to dig its way out, right? It's a MOLE!" Barack Obama declares he wants a Goldendoodle :: Well sort of . . . There is not a better way to describe a Goldendoodle, than the way Obama does in this clip. Listen, as he describes the type of dog he wants. It is clear that Obama's destiny will become obvious to him as soon as he has a chance to meet, greet, and play with a Goldendoodle. In this picture, Luke is shown in his normal, "I just fall asleep wherever, however" pose. Maybe some of you are thinking this gives evidence that Luke might have been the perfect breed of dog for former President Clinton . . . you may be right. However, President Obama is going to face unforeseen challenges from all angles. He will not need a high strung crazy First Dog yapping and running through the White House in times of crisis. He will need a dog that can sleep through terrorist attacks and stock-market crashes without disturbing the neighbors. 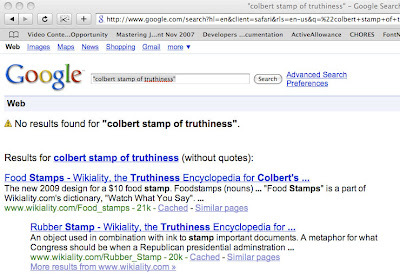 Google "Colbert Stamp of Truthiness" :: What do you get? That's Right! --- NOTHING! Because it doesn't exist. Read the entire entry linked below to see why it should exist, who invented it, and why Mr. Colbert should award the first ever "Colbert Stamp of Truthiness Certificate" to the aforementioned inventor of said certificate. Click here to read that entry. Barack Obama's Doodles are Indeed GOLDEN! The Black Book website just ran a story outlining the psychological implications of a "doodle" that President Elect Obama drew for a charity auction last year. I found the article quite interesting, but more importantly, I found it interesting that a "DOODLE" of Barack Obama sold for over 2 THOUSAND DOLLARS. Just more evidence that all the doodles associated with Barack Obama, are indeed, GOLDEN! To read part one of my two part post, about exactly why the Goldendoodle is the "Dog of Destiny" for this Obama Presidency, click here. The doodle Barack Obama sketched during a Senate session that sold last year for $2,000 was analyzed this morning by an expert on MSNBC . . .
Help me, Mr. Stephen Colbert. on my Goldendoodle comedy material. Not The Bump, I need The Stamp. I know what you are thinking. You are thinking that this "Stamp of Truthiness" doesn't even exist. I realize that. I am asking that you create one! As President Elect Obama narrows his list of choices for the White House canine, the Goldendoodle remains a frontrunner. The breed's potentially imminent rise to fame could have every pundit, commentator, and comedian soon cracking "doodle" jokes. As I'm sure you will see, this jeopardizes the uniqueness of my original material. My argument as to why the Goldendoodle would be metaphorically appropriate for the Obama presidency will follow in the next few days. (And now can be read here.) For now, I'm hoping for your assistance in preventing the unwarranted spreading of the doodle-wealth! I am in need of a clearing house of some kind - one with credibility and impartiality equivalent to the Library of Congress. I must find an agency that will certify to the free world that I, Marty Simpson, was indeed the first comedian standing up for the Goldendoodle. Then, if while on the road, members of the audience call into question the validity of my doodle humor, I can simply say, "AU CONTRAIRE! My doodle humor is the premier, according to Stephen Colbert, The Truthiness Swami Extraordinaire." I patiently await your response. If you haven't read ::Part 1:: you can do that here. I would like to put on the record, that I am a very big fan of the President Elect. I have historically been a conservative. Mr. Obama, the man, caused me to do more research than I had ever done before on the elections. I was extremely impressed with him as a candidate, a leader, a father, a husband, a debater, and a person. Through this election cycle, it was intriguing the responses I would get when I would tell people I was "undecided." My liberal friends thought that it was impressive that I would not simply be pulling the "conservative" handle, and my conservative friends, after they would get over their initial shock, were constantly wanting the short version (so they would not have to do any actual research themselves) that I could give them on exactly why I believed Mr. Obama was, in fact, not a terrorist. All the interest that my "undecided" status garnered lead me to an important proclamation. I am officially remaining "undecided." I did vote, and I know for whom I voted. So I could fully support the actual victor, I decided never to divulge the candidate for whom I voted. So, with all that being said, I would like it officially noted, that while I am not admitting who I voted for, I am definitely giving the President Elect my utmost faith and respect, and I am pledging to do my part to support his Presidency to the best of my ability. I am also willing to say, openly, that I am very excited about the leadership that this President Elect has shown through the election process, and I am sincerely looking forward to the first Presidency of an African-American in our great country. The reason I say all this is because the next few paragraphs are meant entirely as satire. If that goes unnoticed it could be thought that I am somehow belittling the man, Barack Obama, and his family. In fact, it is exactly the opposite. 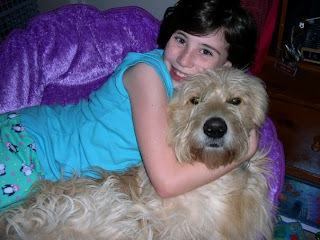 I will be drawing comparisons of the Obama family to my wonderful goldendoodles. It is quite clear from my comedy and my writings that I sincerely love my dogs. It is also very clear to all of my friends that I have spoken with about Mr. Obama, that I truly respect him and have a great admiration for him professionally, politically, and personally. If someone tries to make me out to be evil for comparing the Obama Presidency or his family to my dogs, then they are missing the point of this article all together. This article is meant to be an over the top, tongue and cheek, expose' as to why the actual best choice of dog for the President and his family would be a Goldendoodle. If, Stephen Colbert, were saying the following things, they would be funny without the disclaimer because you would know the attitude from which they came. Since you don't know me or have any way to base your judgements on me about what is written, I kindly ask you to picture Stephen Colbert saying the following things on his show. Treat the potentially inflammatory comments as if they were being said by the wonderfully misinformed Mr. Colbert. Then the accurate tonality and inflections will be perceived. I hope the previous disclaimer will suffice. On with the satire! Many shelter dogs are mutts, like me. Here is where the metaphor continues to play out with the Goldendoodle. Barack Obama is the son of a white woman and an African (black) man. In "Doodle-terms" this would make Mr. Obama an F-1, or First Generation Doodle. Another term used for "mutt" is "Heinz 57" which implies the "mutt" may actually have DNA from 57 other dogs. Mr. Obama, clearly has DNA from two pure-bred "breeds," black and white. 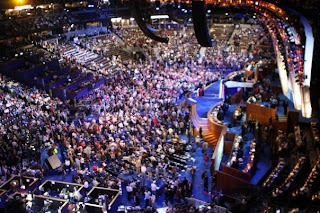 HYBRID VIGOR :: Does Obama Have It? Here is what the Goldendoodles.com website says about F-1's. F-1's are a first generation cross, and as such they exhibit hybrid vigor. This is a phenomenon in animal breeding referring to the fact that the first cross between two unrelated purebred lines is healthier and grows better than either parent line. The hybrid cross between these two parent breeds are terrific with families, generally friendly, intelligent, affectionate and easy to train. 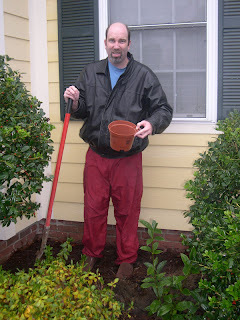 The evidence that Mr. Obama does indeed contain this hybrid vigor is quite clear. To say nothing of the fact that he defeated all the odds and defied the pundits' predictions of his inevitable defeat, we will address the Doodle traits specifically mentioned above. As for 'easy to train,' his impenetrable voting record would indicate that the Democratic Party found him quite the trainable protege. ...and grows better than either parent line. Breeding experts all agree that cross breeding F-1's is not the best way to produce predictable genetic results. Therefore, Mr. Obama, an F-1, made a wise decision to choose Michelle, a purebred, as his wife. (Again, see disclaimer if this seems like I am harshly comparing Mrs. Obama to an animal. Gentle Reminder: It's satire.) Therefore, his offspring would then be much more likely to inherent that hybrid vigor as well. 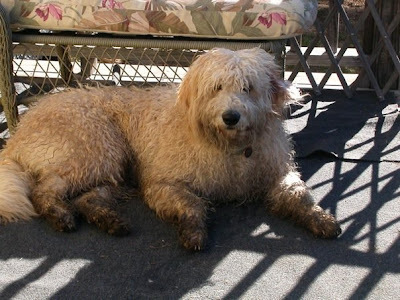 In Mr. Obama's case, using doodle-terminology, he has 'mated' with a pure-bred. Therefore his children, Malia and Sasha, will get half their genetic make-up from a pure-bred (their mother) and half from an F-1 (their father.) Breeding websites say these ratios produce a seventy five percent ratio from the F-1 and 25 percent ratio from the pure-bred and are deemed an F-1b. 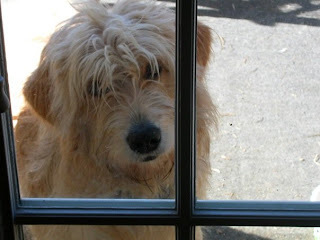 To add more irony to the pile, the actual breed of Goldendoodle did not even exist until the mid-1990's. Do any of you know when Barack Obama's political career got started? RIGHT! The mid-1990's. 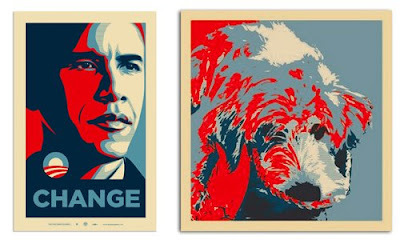 It's like the Goldendoodle is the dog of destiny for the Obama Presidency. From this point forward I will officially be disappointed in any other "dog-picking" decision made by our President Elect. I say, stick a feather in its cap and call it macaroni! - It's a Yankee-DOODLE-Dandy! Again, if you missed the disclaimer, please re-read the first 80 percent of this article. I officially own this word now. Copyright is from the point of inception. I thought of this word, then immediately registered the domain name. In today's world, the person who registers the domain has the best argument for having thought of it originally. If there were other people that used this word and thought it was clever, you were right. Unfortunately for you, you are not allowed to use it anymore, unless you are referring to Stephen Colbert. Well, of course, you can use it at your own risk, like you download music illegally, but just know that if I have a way to catch you, I will! The following is a quote from the BaltimoreSun.com's, Julie Bykowicz, dated November 8, 2008. It concerns President Elect Obama's possible choice of a Goldendoodle as his "First-Dog." A goldendoodle? They'd be the laughing stock of the country. Genetics are very important. They should go for a purebred. (Specifically, she recommended the Sen. Edward M. Kennedy-favored Portuguese water dog). Number Two: Has she been living under a rock for 21 months? 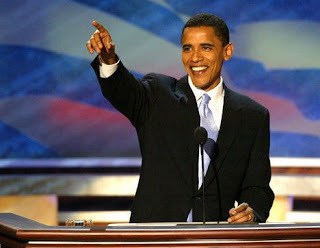 The journey President Elect Obama completed to get where he is today is a remarkable one. Is it possible that this journey could be well represented metaphorically by the Goldendoodle? 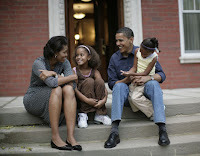 Barack Obama has the chance to unite the races by bringing the best attributes of the two races into The Oval Office. The idea that Bykowicz implies in her article that the President should feel somehow obligated to choose a "pure-bred" dog is some what short sighted, especially in this case. Maybe she has overlooked the obvious fact that Mr. Obama himself is not a pure-bred? The Goldendoodle takes the best traits of the Golden Retriever and the Standard Poodle and combines them creating one of the most lovable, gentle, and well behaved dogs that one can possibly hope to ever own. I hope that the Obama family does decide to choose a Goldendoodle for the "first-dog" continuing the idea that this country needs change. 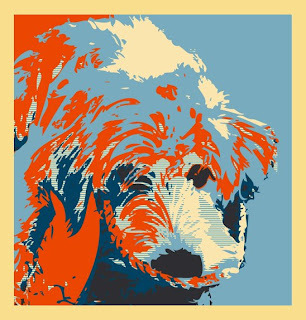 Change from 200 years of discriminatory policies practiced in the White House by past presidents in their failures to choose a cross-bred dog as their animal of choice. Isn't the cross-breed just flat out MORE AMERICAN? Click below to read an excerpt from my sit-com. It is a very brief (2 minute) scene from the sit-com which chronicles the original purchase of the Doodles. PDF of Sit-Com Scene where we buy Gus and Luke. This morning it was cold. When it's cold my wife starts the car for me as she leaves for school with the kids. Evidently, she left the door open after she did this. 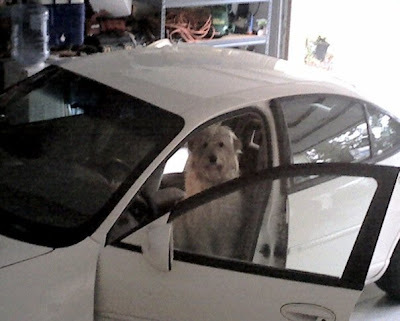 I entered the garage to find Gus ready to drive us both to work. I think he was actually disappointed that he didn't get to drive when I kenneled him up. I think Gus thought he hit the mother load with this one. Every time something like this happens, it was worth seeing the look of guilt in his eyes. It kills me...Can't you see the thought bubble in his head - " . . . What? . . . seriously . . . what? " 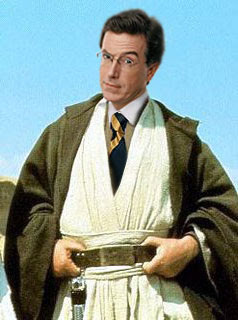 Help me, Mr. Stephen Colbert.You're my only hope. Why Starting Connor Shaw Proves Coach Spurrier is the Mad Genius! And 5 Other Reasons to Back That Up!